Project obstacles and solutions: River North at Keystone is a mixed-use building that combines high-end office spaces, residential apartments and retail stores. The real estate venture was developed by PK Partners and will house the headquarters for the Gene B. Glick Company. The building offers 100,000 square feet of office space and 198 luxury apartments. The first floor has 4,000 square feet dedicated to retail space. The property is also served by a six-level parking garage that is designed to support the facility traffic. Dillon Construction was awarded the contract for this project. 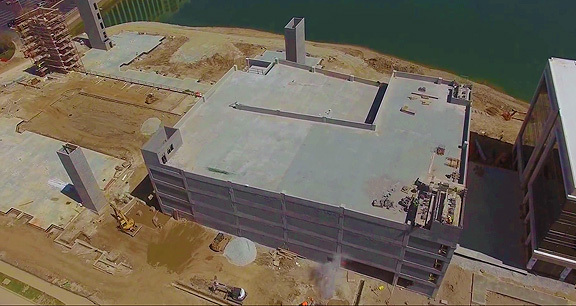 Midwest Form Constructors did all of the concrete work on the parking garage. The engineering specifications required an 8,000 psi mix for the concrete columns and a 6,000 psi mix on the decks. The decks were designed with post-tensioned concrete reinforcement. The concrete had to achieve a strength of 3,000 psi in 24 hours so the tendons could be stretched. IMI QC/QA used a high-range water reducer to lower the water-to-cement ratio to get the early strength required. IMI supplied a total of 4,500 yards for the parking garage project. For more information on gaining early strength and post-tensioned concrete, contact the sales representative for the plant nearest your location. Click here.